New to Hockey? No Problem! If your family is new to hockey, you are most likely starting at the Little Kits (ages 3-5), Big Kits (5-7) or 8U Mite (ages 6-8) level. The primary objective at these levels is to have a lot of fun while developing basic hockey skills. Is my child ready for hockey? If your child has completed a Learn to Skate program through the City of Evanston or another program, he or she is ready to play hockey! Learn to Skate is offered throughout the year so that kids are ready to play hockey during the fall/winter or spring seasons. Contact Robert Crown Community Center (847-448-8258 or jfaedtke@cityofevanston.org) for the list of current Learn to Skate classes being offered. Once your child completes Learn to Skate, he or she is ready for Little Kits or Big Kits. Little Kits is geared primarily toward kids who are 3-5 years old. Our Little Kits have one combined practice/game per week, held on the weekend at Robert Crown Center in Evanston, 1701 Main Street. The practice/game typically lasts one hour or less. Little Kits is administered by the Evanston Jr. Wildkits. Email Christine Perkins at jrwildkitshockey@gmail.com with any questions. Big Kits is geared primarily toward kids who are 5-7 years old. Our Big Kits have one practice and one game/scrimmage per week, held on the weekend at Robert Crown Center in Evanston, 1701 Main Street. The practices and games typically last one hour or less. Big Kits is administered by the Evanston Jr. Wildkits. Email Christine Perkins at with any questions. What if my child has completed Little Kits and Big Kits, what is the next step? Evanston Hockey and the Evanston Jr. Wildkits offer 8U Mite hockey at the house level and travel level. There is a fall/winter season (typically September-March with a two-week break during the winter holidays) and a spring season (typically March-May). The house program is geared toward players who are interested in playing on a team, and typically want to play on weekends. The house league emphasizes skill development and fun with volunteer coaches, typically parents. For our 8U house players, there is typically one practice and one game per week, both usually on weekends. Evanston Hockey administers the house program. The travel program gives players the chance to play full-ice games against other programs. Our 8U travel players have two practices per week (typically weeknights), plus usually one but sometimes two weekend games. Evanston Jr. Wildkits administers the travel program. For all levels, each practice and game typically lasts one hour or less. How can I register for any of these programs? Registration for Little Kits and Big Kits typically opens about a month before the next session begins. Sessions take place Sundays from 10:30-11:30 a.m. Little Kits costs $150; Big Kits costs $350. Email Christine Perkins at to register. Registration for the fall house and travel leagues typically take place in late August/early September. The spring season registration typically opens up in February. Registration for Little Kits and Big Kits is currently available on juniorwildkits.com but will be transitioning to evanstonhockey.com. Registration for 8U travel will be available on evanstonhockey.com. Registration for 8U house will be available on evanstonhockey.com. Is there a chart that shows me the progression of my future hockey player? Yes, check out this handy chart here. When will my player skate? Our Little Kits have one combined practice/game per week, on the weekend. Big Kits have one practice and one game per week, on the weekend. For our 8U house players, there is typically one practice and one game per week, both usually on weekends. Our 8U travel players have two practices per week (typically weeknights), plus usually one but sometimes two weekend games. For all levels, each practice and game typically lasts one hour or less. Little Kits and Big Kits are offered in 6- to 8-week sessions throughout the year. The house and travel hockey seasons start in September, including a pre-season camp, and ends in March, typically with a two-week break during the winter holidays. Where will my player skate? Little Kits, Big Kits and 8U house players practice and have in-house games at Robert Crown Center in Evanston, 1701 Main Street. Our 8U Travel players practice at Robert Crown Center and play games throughout the area along with 1-2 out-of-town tournaments. What hockey equipment does my player need? While Evanston Hockey does have limited equipment players can borrow, it’s best to have a helmet with full face shield, skates, stick and gloves at a minimum. Additional required equipment includes: shin pads, protective/pelvic cup, shoulder pads, elbow pads, hockey pants, mouth guard and hockey socks. Interested players without equipment should contact Evanston Hockey at . In addition, Play It Again Sports Evanston (1908 Dempster Street) and Gunzo’s (6730 Dempster Street, Morton Grove) also have equipment for purchase. Once teams are assigned, your player will receive a team jersey and a set of game socks that are yours to keep. What does it cost to play hockey? Evanston Hockey works hard to keep season fees steady. Hockey fees are announced in advance of sign-ups with discounts available for goalies and multiple siblings. On average, Little Kits costs $150, Big Kits $350, 8U house hockey costs $800 and 8U travel hockey costs $2,850. Do boys and girls play on the same teams? Yes. Boys and girls play together; Evanston Hockey offers a girls only program at the 12U/14U level. What is the difference between 8U House League and 8U Travel League hockey? The basic difference is the age and skill of each level. 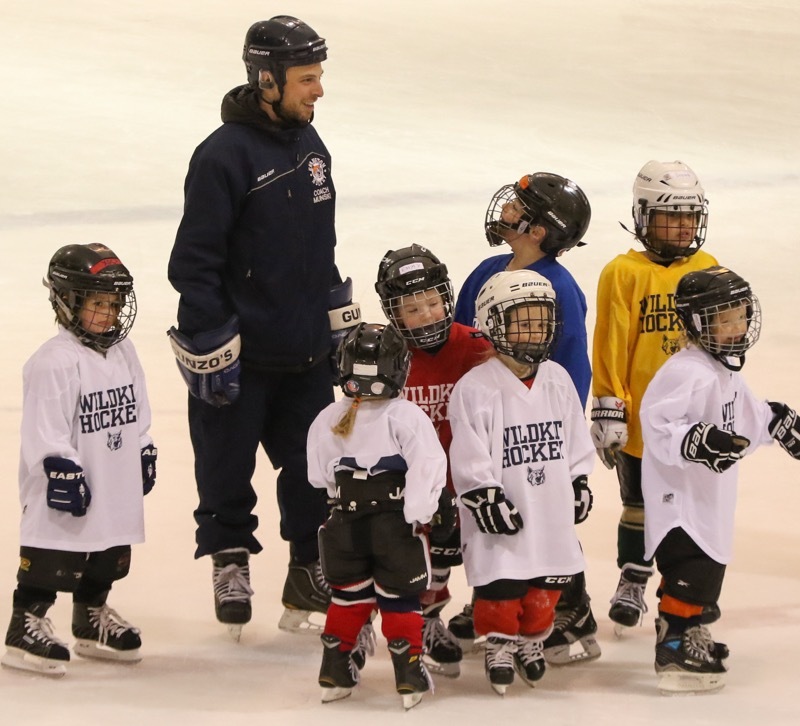 Evanston Hockey runs the 8U house program where players play 3V3 in-house games while the Evanston Jr. Wildkits manage the 8U travel program, which gives 8U players the chance to play full-ice games. For our 8U house players, every effort is made to create competitively balanced teams, as mandated by the local league. Our 8U travel players try out for a team, which is formed based on skill level. Little Kits and Big Kits are divided each week into teams to play each other. This depends on registration numbers. Evanston Hockey likes to form team sizes to provide more playing opportunities for our youth. Are there any options for financial assistance or payment plans? Financial aid is available for those who demonstrate need. Applications can be submitted in advance of each season. The Evanston Hockey Finance Committee will consider all requests. Contact if you have a financial need. Please send an email to with general questions. You can also contact Evanston Hockey Director Del Morris at .